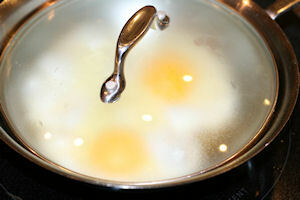 Have you ever heard of or tried to make basted eggs? Well check our this exerpt on YouTube from an episode of Adventures in Wine Country in which Val instructs the host in the art of preparing basted eggs http://www.youtube.com/watch?v=daeTjS-0Ubc. Of course an even better idea then making them yourself is to spend a night or two or three here at the Hillsdale House Inn and have Val make them for you. Check out our Special Offers & Packages where you may find something of interest as well.